Gujarat is known as the land of great contrasts. From Deserts to Sea-shores, from Hills to fertile agricultural plains, from religions to cultures, Gujarat is beautiful and brimming with amazing opportunities. With the Indus Valley Civilization sites to Buddhist Monastery sites and the famous Somnath Temple, the past is still alive here. Gujarat offers a great variety of tourist destinations. Here you can find tracking and adventure destinations like Gir Forest, Polo Forest, and Saputara, here you can chill at pristine beaches like Madhavpur and Nargol beach, or you can visit religious destinations like Dwarika, Somanath, Palitana, and Akshardham. Apart from being the most attractive investment destination in India, Gujarat is also the home of some of the best places to visit in India. Whether you are on a business trip or a vacation, whether you are with family or a solo backpacker, here you can find your inner peace. Here you get numerous options for adventures for the fun lovers, places of worship for seekers of faith, and best Naturopathy centres in India for the fitness freaks. 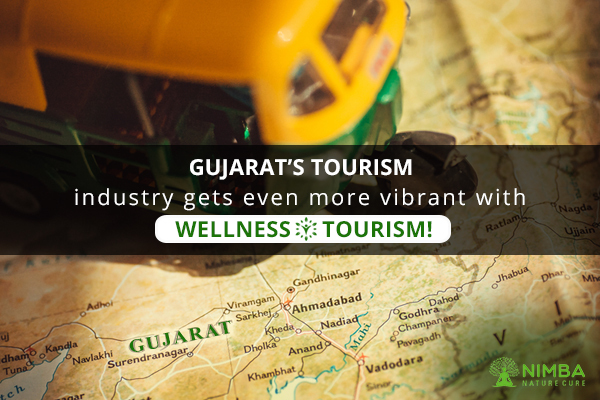 The latest revolution that has given a great boost to the tourism industry in Gujarat is the Wellness Tourism. Gujarat has been known for the amazing hospitality and food, but with Wellness Tourism a new dimension has been added i.e. health and wellness. Wellness Retreat in India like Nimba Nature Cure offers amazing wellness solutions like Detoxification, Naturopathy, Yoga & Meditation, and other Special Therapies. Feel the healing power of nature. Surrender to nature and let it correct all the imbalances in your body. Experience rejuvenating Naturopathy treatments like Mud Packs, Massage Therapy, Hydro Therapy, Naturopathy Diet, Ion Detox, etc. at Nimba. Benefit from the ancient wisdom of Ayurveda through the best ayurvedic treatment in India. It is the ultimate science of healing which eliminates the health problem from its root cause. Feel the goodness of therapies like Shirodhara, Potli Massage, Udhvartan, Pizhichil, etc. at Nimba. Give yourself a chance to relax and feel the inner peace through yoga-and-meditation. Explore yogic therapies like Therapeutic Yoga, Shatkarmas, Yogasanas, Kapalbhati, Aquatic Yoga, and Power Yoga at Nimba. Apart from the regular Naturopathy therapies, you can also experience healing therapies from across the world such as Acupuncture, Hot Stone Massage, Cupping Therapy, Reflexology, etc. too at Nimba. Think about extending your stay and visiting some of the iconic destinations of Gujarat while you are staying at Nimba Nature Cure. Here are the most revered tourist destinations near Nimba Nature Cure. So, do you think, taking a timeout and giving your body a chance to heal itself, is a good idea? Come to Nimba, it is the perfect getaway from stressful city life. Come to Gujarat and experience the beautiful synergy of cultures, religions, terrains, foods, colors, and beauty.